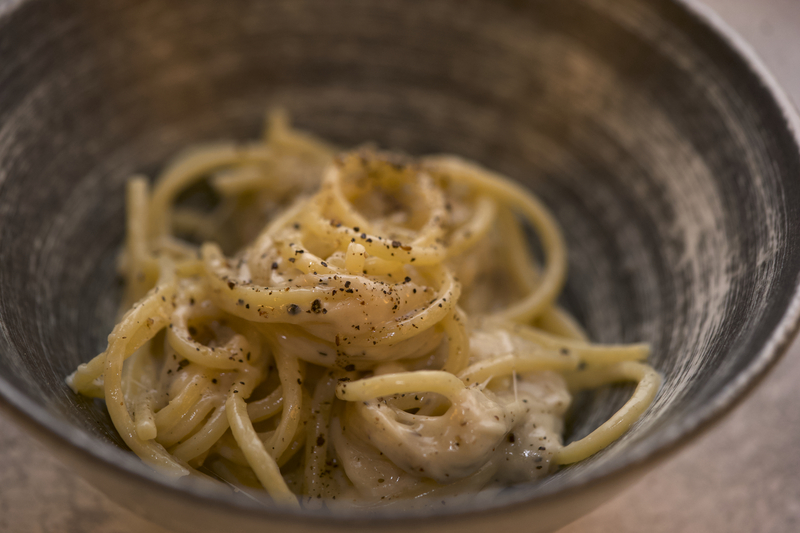 This dish appears to be very simple but is actually incredibly complex. 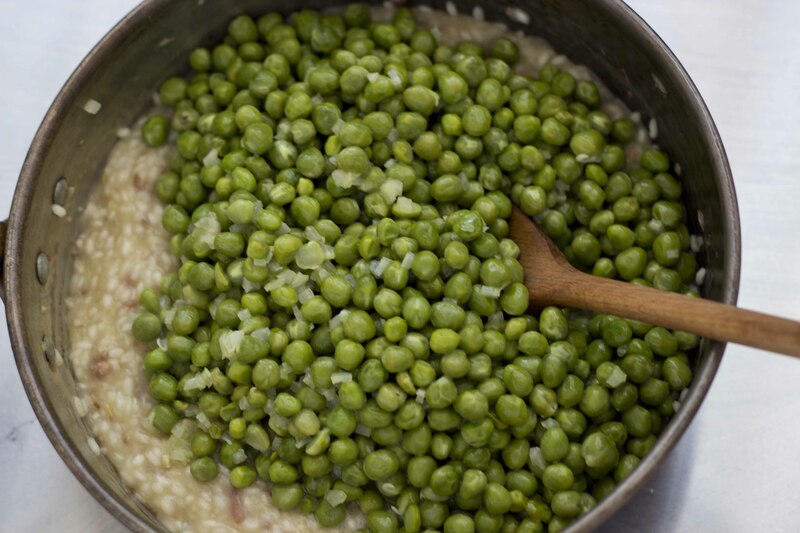 It is not an accident that risotto is considered to be posh. 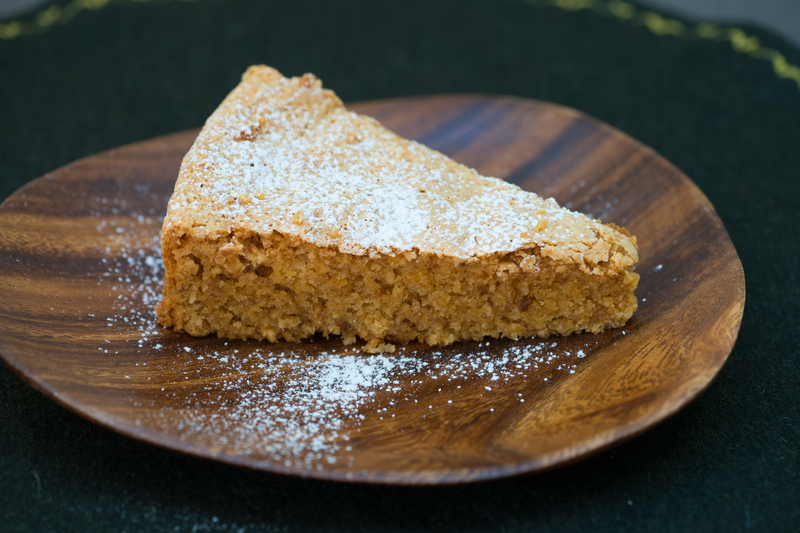 This is not only because rice tends to be eaten in the wealthier north of Italy but also because the dish involves butter, less frequently eaten in much of Italy, and cheese. 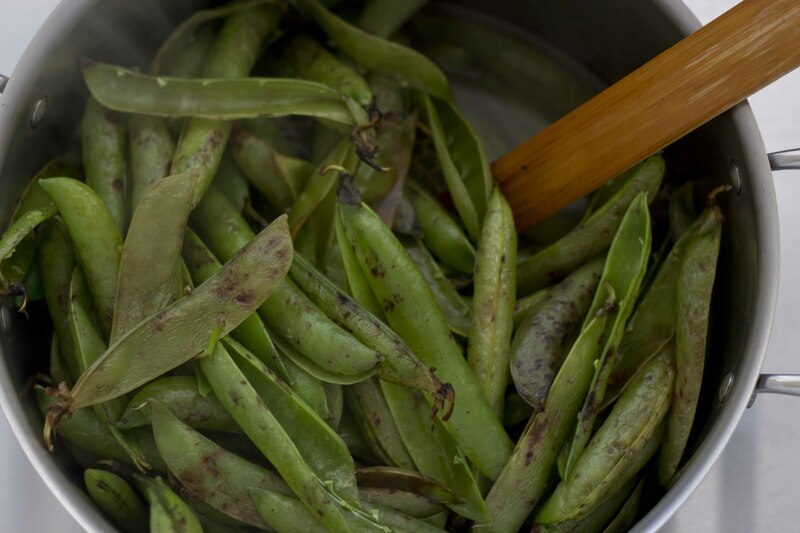 The dish is very nutritious and suitable for children as it has lots of vegetables in the stock which are unseen and rice and sweet peas are a favourite of children. The goal here is a pea per grain of rice. 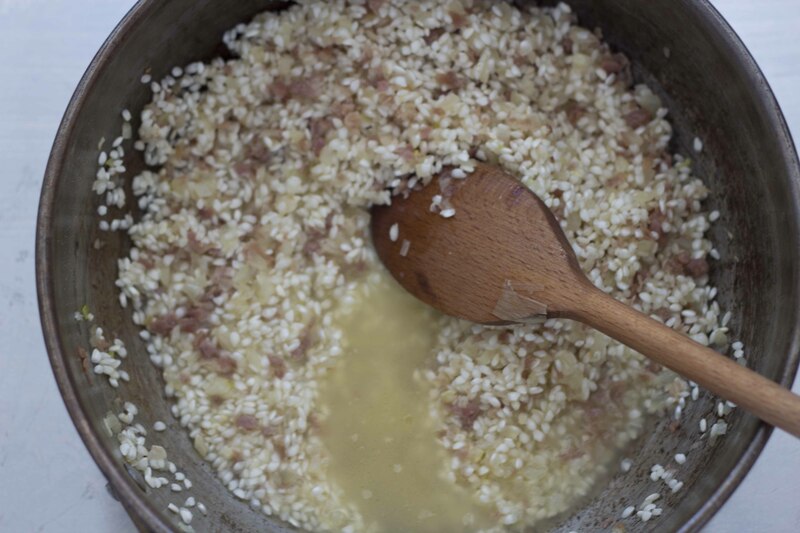 The broth used in making risotto needs to be hot otherwise it increases the cooking time and the correct texture is not achieved. The vegetable broth recipe is adapted from an Angela Hartnett recipe. See Notes on how to prepare this dish quickly. Bring the vegetable broth to a simmer and add the leek, onion, carrots, celery ribs, the basil, the pea pods, and the fennel seed and cook for another 5 minutes. Remove the solids with a slotted spoon. Add the lemon and let cool. 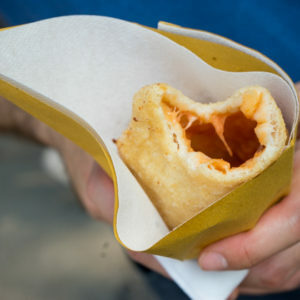 Allow to sit, at least 20 minutes but ideally overnight in the refrigerator. 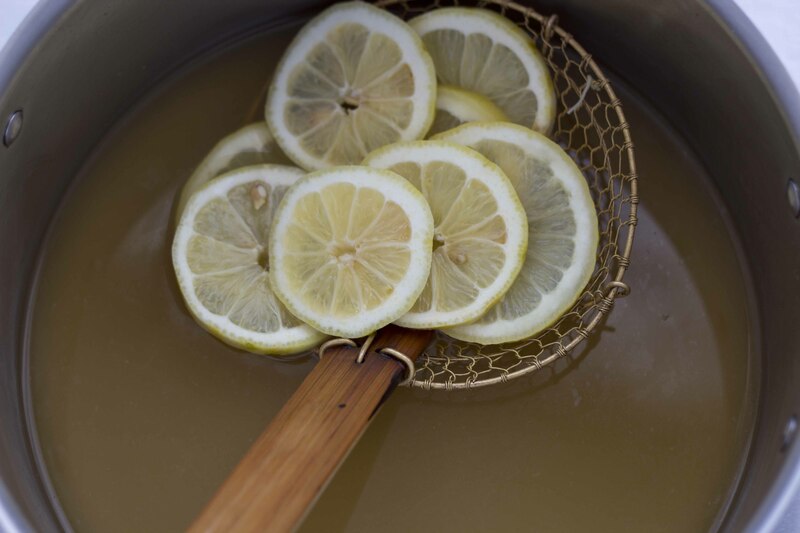 Remove the lemon with a slotted spoon. Heat the prepared broth in a stockpot bringing it to a boil. 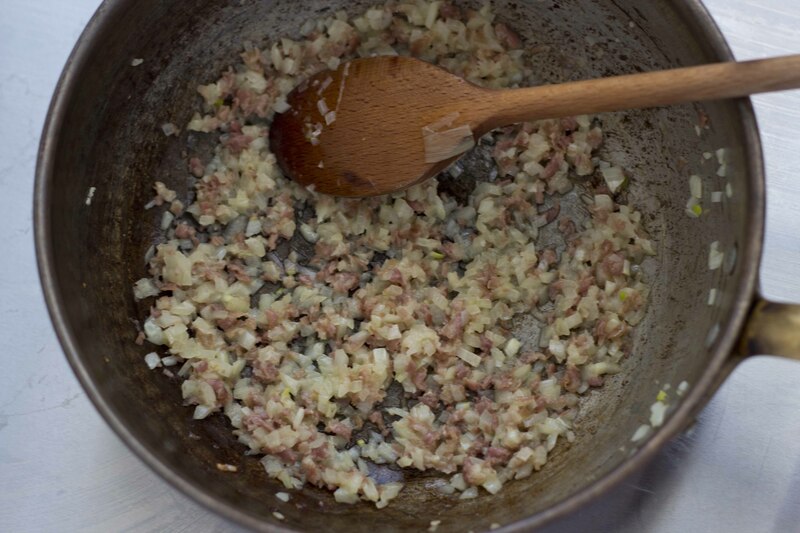 In a risotto or sauté pan, add 25 grams of butter, the onion and prosciutto. Heat the pan over low heat and cook until the onion is translucent and soft, 15 to 20 minutes. Add the rice, stir constantly, and toast for 4 to 5 minutes. Add the white wine and stir until evaporated. Add 400 ml of stock, stirring, 1 ladleful at a time until almost cooked. Keep enough liquid in the pan and stir continuously so that the rice does not stick to the pan and cooks evenly. 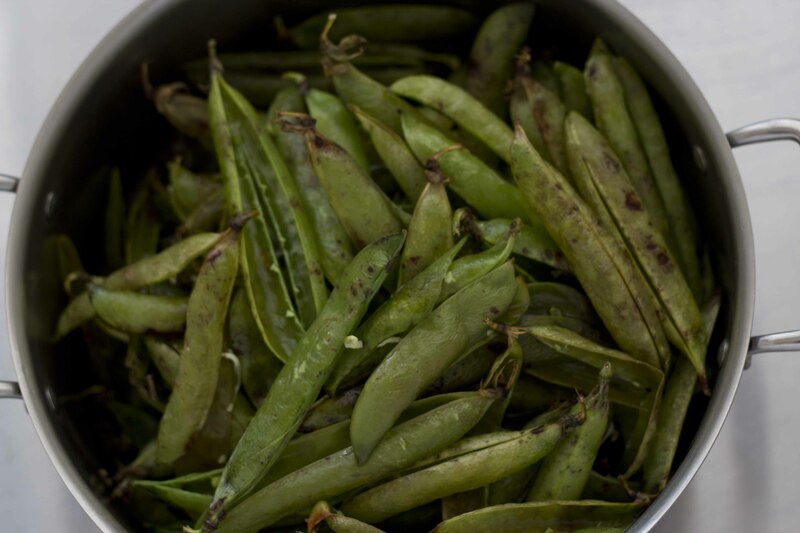 Separately in a sauté pan, heat 25 grams of butter and gently sauté the peas and broad beans or celery over low heat until cooked (the time will vary depending on the age of your peas and broad beans but large peas will take about 12 minutes). The vegetables should not fry, so add a bit of water or broth if needed. Add salt to taste. 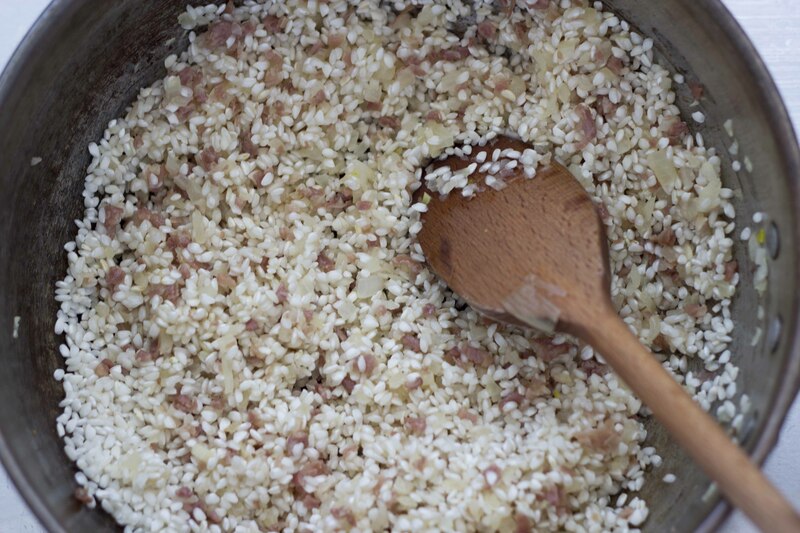 When the rice is done to your liking (Italians eat risotto with the centre a bit hard and there should be a lot of liquid in with the rice but should not be a soup), about 20 minutes in total, then remove from the heat and add the vegetables to the rice. Add half of the Parmigiano-Reggiano cheese and the remaining 75 gms of butter and stir. Adjust the salt to taste and serve dusting with the remaining 50 gms of Parmigiano-Reggiano cheese. Use store bought stock or water. The flavour will not be the same but will still be tasty. 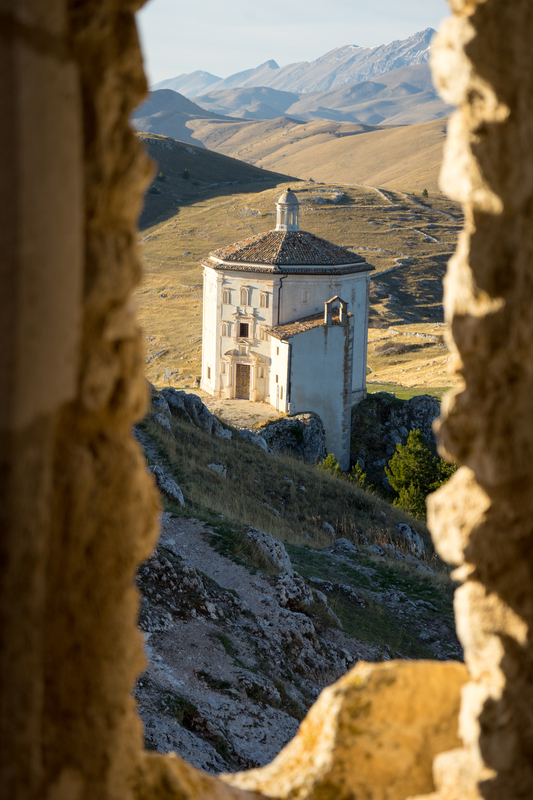 Place 100 gms Parmigiano-Reggiano cheese in the mixing bowl and grate 10 sec/speed 10. Transfer to a bowl and set aside. Place 20 grams of celery into the mixing bowl and chop 7 sec/speed 7. Remove and set aside. Place 1 leek (white part), 1 onion, 2 carrots and 4 celery ribs for the broth into the mixing bowl and chop 5 sec/speed 5. Add 1 litre vegetable broth, 8 basil stems, pea pods (if possible) and 10 fennel seeds to the mixing bowl. Cook 7 min/100C/Speed 1. 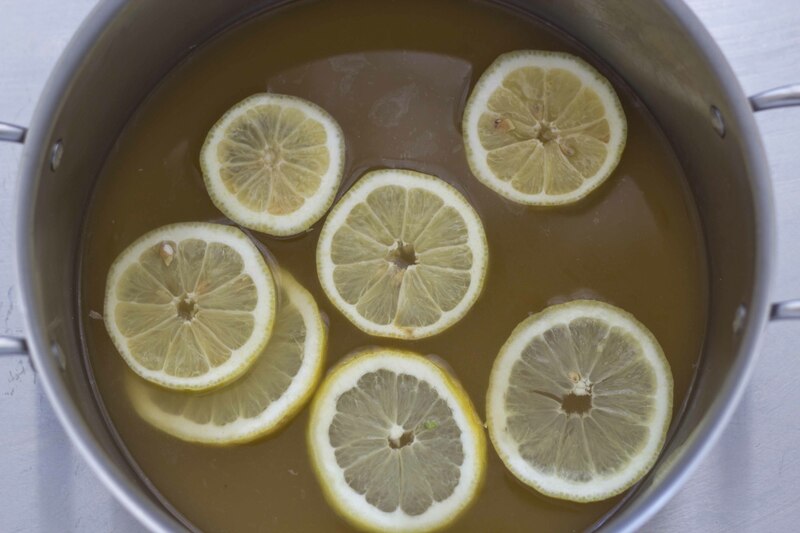 Remove and place in a bowl with the sliced lemon. Set aside. Rinse and dry the bowl. Place the onion into the mixing bowl and chop 8 sec/speed 5. Scrape down the sides with the spatula. 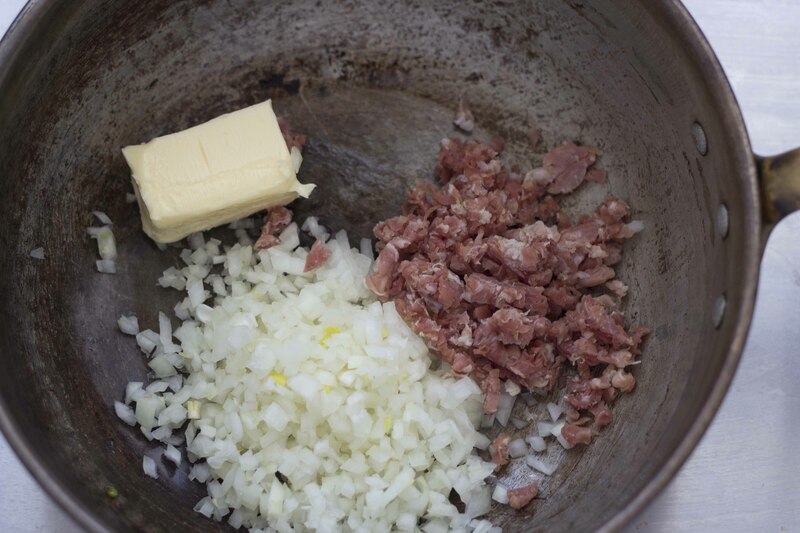 Add 50 grams pancetta or prosciutto and 25 gms butter and saute 4 min/120C/speed 1. 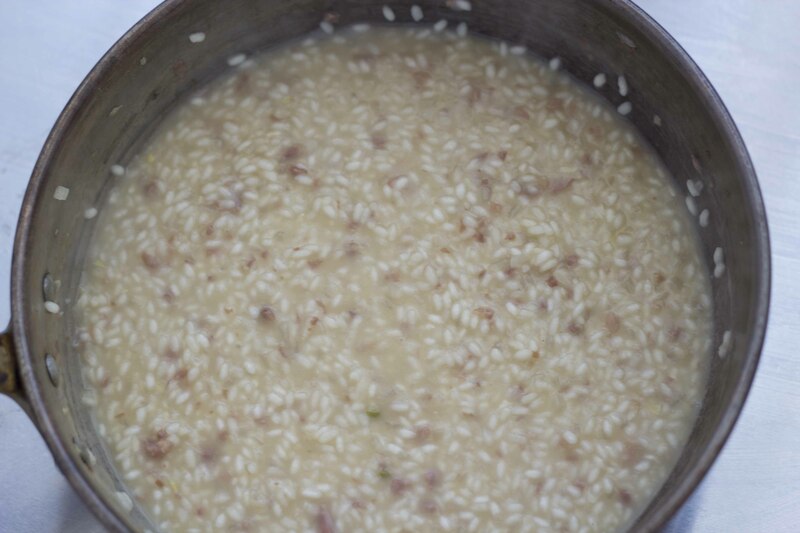 Add 350 grams risotto rice and saute 3 min/120C/reverse speed 1. Leave the measuring cup off the lid. Add 60 mls white wine and cook 1 min/100C/ reverse speed 1. Leave the measuring cup off the lid. Strain the reserved broth and add 720 grams of broth to the rice with 5 grams of salt. Cook 12 to 13 minutes/100C/reverse speed 1. Place the simmering basket on top of the lid. 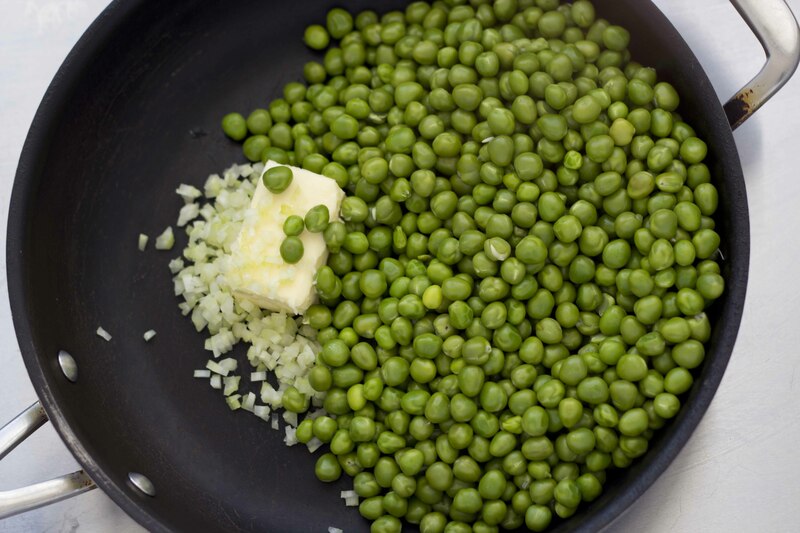 Meanwhile in a frying pan, heat 25 grams of butter with 200 grams peas, 200 grams broad beans and the reserved chopped celery over low heat until cooked. Add salt to taste. 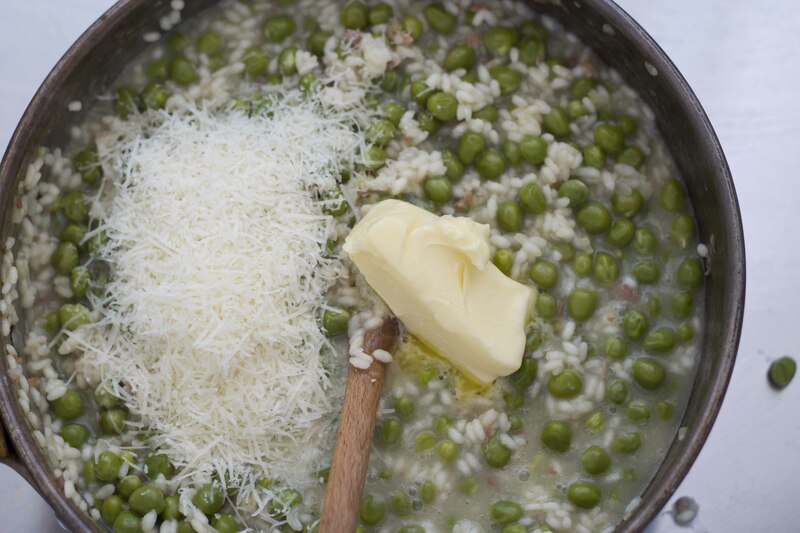 When the risotto is finished, remove the risotto and place in a bowl. 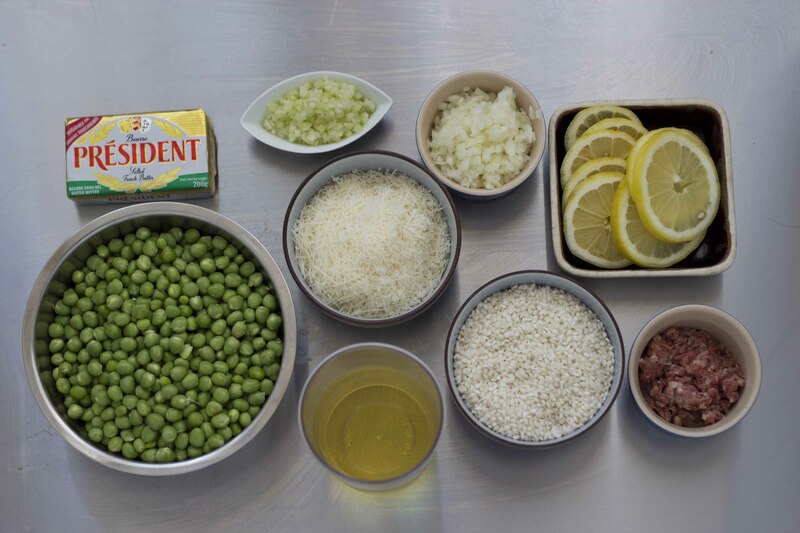 Add the peas, Parmigiano-Reggiano cheese and 50 gms butter. Stir to combine and serve.